I like salad. But only when the weather is warm, which can create the illusion that I really don’t like salad. However, it seems that the sun is really here to stay, and so after last week’s quinoa salad I decided to attempt a pasta salad. The amazing thing about pasta salad is that it is infinitely versatile. I used peas, chicken, lettuce and hard-boiled eggs (as this is what I had in my fridge and was available at the supermarket), but you can add whatever you like or have in stock, including tuna, carrot, tomato, peppers, cheese, etc. The dressing I used was inspired by Not Without Salt, as I wanted to forgo mayonnaise for crème fraiche, which is less heavy on the stomach (plus, my flatmate is not a fan of mayonnaise, so crème fraiche is the perfect substitute). Also, this salad almost tastes better the next day, when all the flavours have soaked in. Mix together all ingredients for the dressing in a small bowl and keep aside. Boil the pasta according to packet instructions (remember to put 1tbsp salt in with the water), then drain and toss with 2 tbsp olive oil. Keep aside to cool. Boil the eggs, peel and chop into pieces. Peel and chop the avocado. Microwave the peas for 3 minutes. Chop the mozzarella into small pieces. For the chicken, boil 1 cube chicken stock with 500ml of water. When the water boils, gently drop in the chicken breast and turn down to medium. Cook the chicken this way for around 20-25 minutes, until it is poached. Remove from stock and leave to cool (I didn’t, and suffered for it) before shredding it with your fingers into small pieces. Remember to reserve 2 tbsp of the stock. 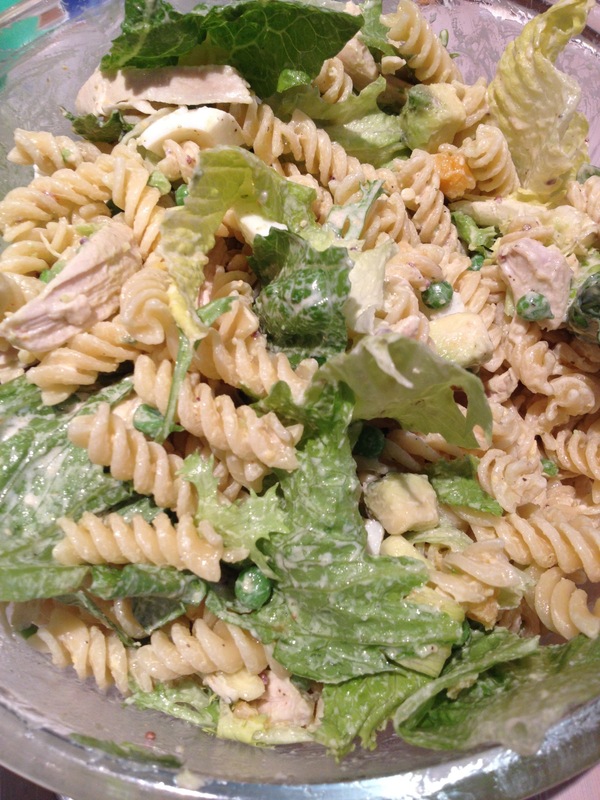 Then, mix together the pasta, lettuce, eggs, avocado, peas, mozzarella and chicken before pouring the dressing over everything and mixing once more. Serve immediately and enjoy! Like I said before, nothing in this recipe is fixed (apart from maybe the pasta itself). Chicken can be substituted for fish, ham, chorizo… the vegetables can be anything you choose. Just prepare them however you like (fry, boil, roast) and add them into the mix! Nice to see that you have a blog. I’ll be a regular here. Based the gnocchi that you once cooked for me and Birgitta in Barcelona, everything here should be good, Haha.